the location link above, and at the bottom of this website. 20 h x 16 w in. 33 h x 62 w in. Available for purchase upon request. Please refer to this site's WEB STORE for purchase of this art piece above, or contact the artist for any details or inquiries. 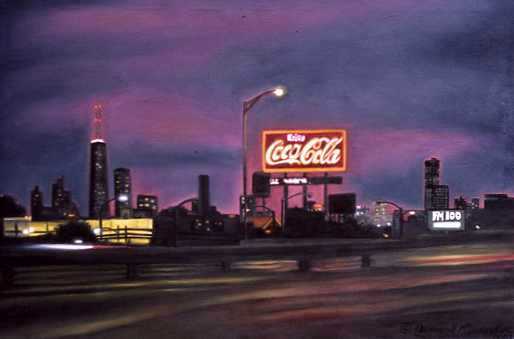 This image was painted by Rousonelos in 1983, and is a view of the past Coca Cola neon marquee that existed in Chicago through the 1980s. The artist often passed by this sign,when he lived in the city, which was near North Avenue and the Kennedy Expressway in Chicago. The flashing lights in the foreground represent moving, flashing cars traveling past on the expressway. Rousonelos was captivated by this cityscape and the intensity of this pop cultural iconic product logo name of Coca Cola, which, from this angle, dominates the Chicago skyline. 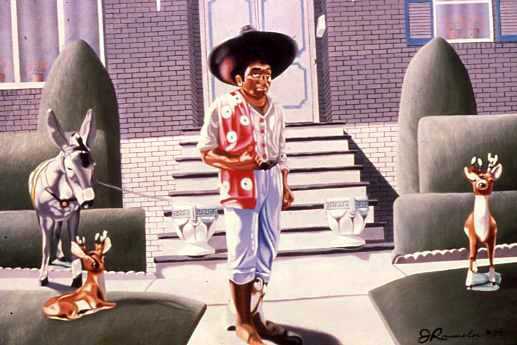 This painting depicts the pop culture icons of ceramic figurines, often borrowed from other cultures, that populate the front yards of many suburban American homes. Rousonelos lived in New Jersey in 1975 and saw these kind of images in suburbia there. This image represents how plastic and symmetrical the environment of suburbia can be. 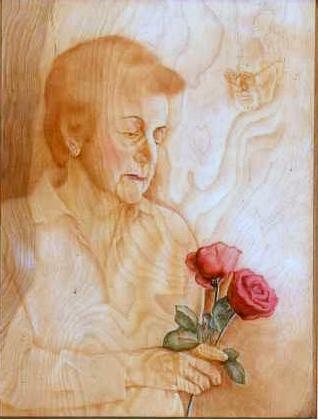 This image above depicts the artist's mother in the foreground holding a red rose, which symbolizes her eternal, spiritual love for her passed husband, whose soulful image floats in the background of the picture. 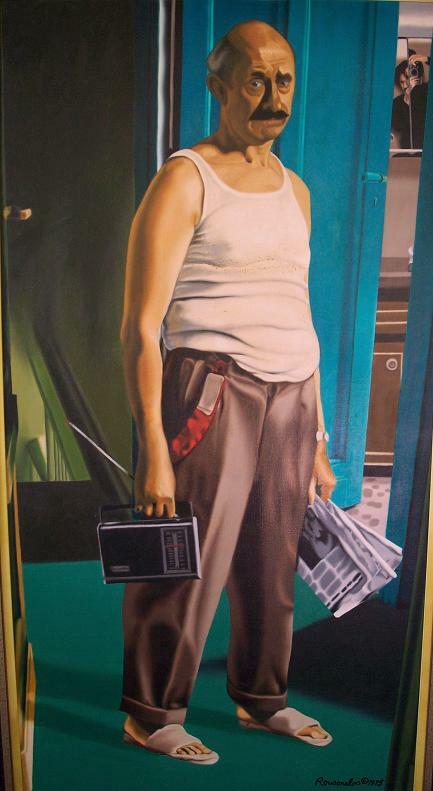 This art piece depicts the artist as the protagonist in his own spiritual and material world. There are numerous symbols in this image such as background figures, leaves, incense burners and three red electrical lights that support the main idea in this piece. Available as a limited edition lithograph measuring 17 x23 in. unframed, 250 signed & numbered prints by the artist. Please look at this site's Web Store (on top page of website) for pricing details on purchasing the artist's limited edition prints and additional original art pieces. Purchases must be handled directly with Mr. Rousonelos. Also, please sign the artist's GUESTBOOK with comments about his artwork. James S. Rousonelos' short biography, contact information (email and phone number) are also found below. Please scroll down to the next section below. 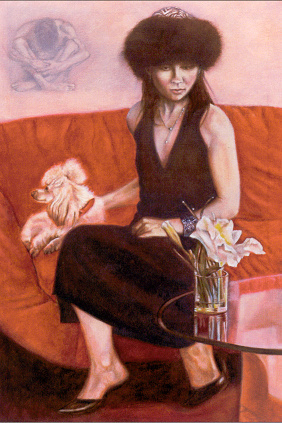 James S. Rousonelos has been a professional artist since 1971. 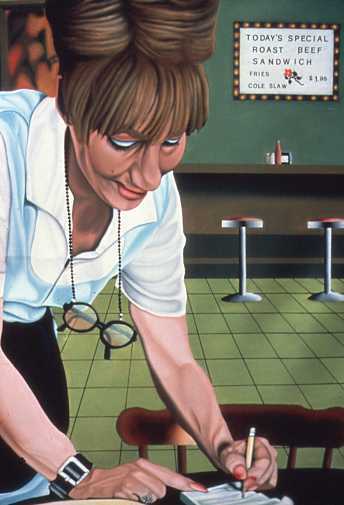 He is a realist painter that specializes in paintings, drawings and prints of people that depict the human condition in our society. 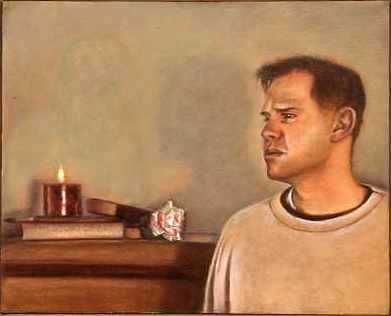 The artist also focuses on portraits of people that are very revealing and spiritual, complimentary and personal. 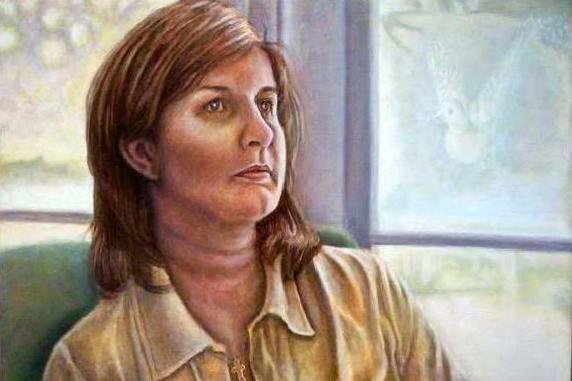 Rousonelos has created a large number of commissioned portraits for art clients throughout the United States and in parts of Europe. 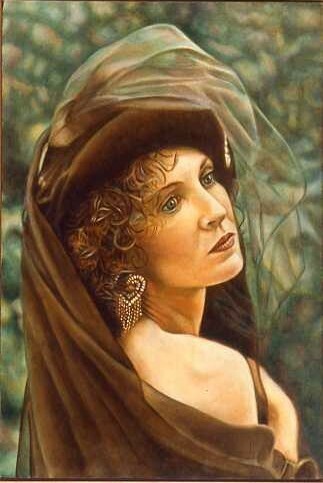 Rousonelos recieved his Bachelor's of Arts degree in painting from Southern Illinois University in 1975 and his Master's of Fine Arts degree from Northern Illinois University in 2005. Rousonelos has taught studio art (painting and drawing) and art appreciation since 1980, and continues to educate the public about the importance of the cultural significance of art throughout the ages of man's existence. His art and art history background focuses on the Italian and Flemish Renaissance period of art. 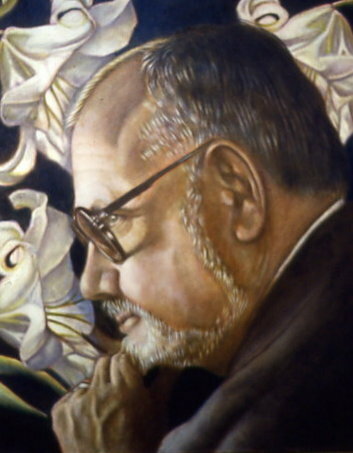 Rousonelos has exhibited his work in galleries throughout the United States and has work in both private and corporate art collections worldwide. 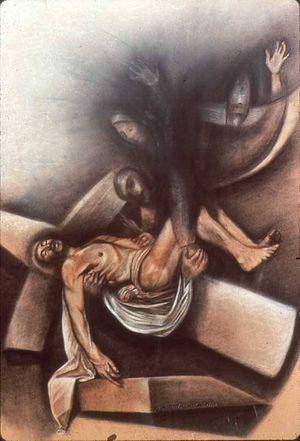 His art work is a form of symbolic realism that contains an element of mystery and spirituality that captures the soul, personality and the deep essential essence of each human being portrayed. The artist accepts inquires about his work through emails at JSRArtStudio@gmail.com and at 773-818-9658 for art/commission inquiries(call and/or text). Phone and text are more direct and immediate. Thank you for your interest in the art of James S. Rousonelos. James accepts commissions to do portraits upon request. Please contact him at the above email address and/or phone number if you are interested in purchasing his work or are interested in commissioning the artist to paint an original portrait for you. All artwork is painted from photo reference material. Prices vary according to medium, size and detail work. 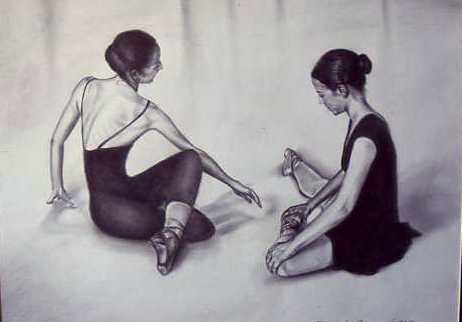 All paintings are created in oils. 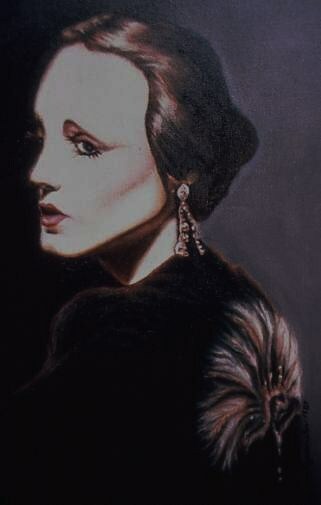 Graphite drawings and pastels are available upon request. Please note: There may be a waiting list for commissioned work, depending on Mr. Rousonelos' art production and exhibition schedule. Any upcoming art exhibitions will be published here when they occur.